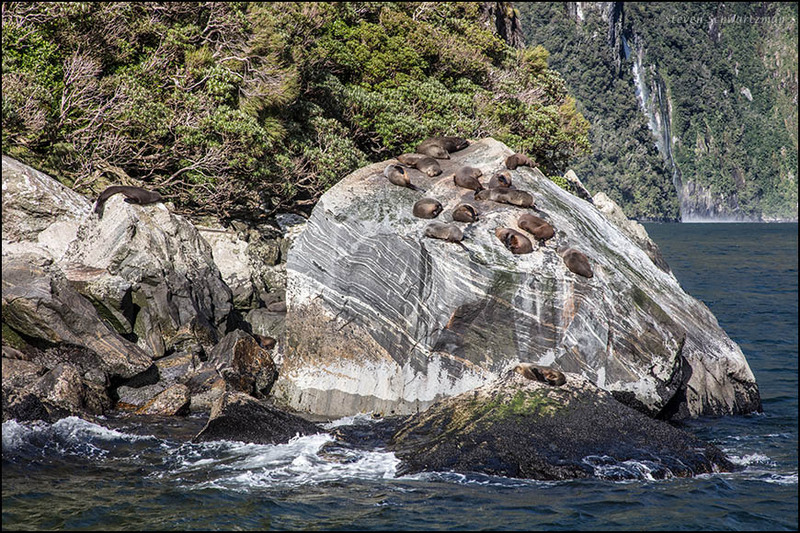 My first thought is how wonderful the stripes are on that boulder, my second is how on earth do those seals get themselves up on the top of those rocks? I have seen them moving and it’s not exactly conducive to rock climbing! I also wondered how the seals get to the top of the boulder, especially given their clumsiness on land, as you said. I don’t believe I ever got a look at the far side of the boulder; I assume there’s a way up the back that’s easier than the seemingly impossible way up the front. They do get into some weird places. It is sad that some of them fall. Such heavy animals designed for water to not do well with that sort of thing. I hadn’t thought about any of them falling. As you say, that couldn’t be good for such heavy animals. When I was kid, I found a steer (or what appeared to have formerly been a steer) on a beach. I also remember a picture in National Geographic of a bunch of sea lions that had stampeded up a cliff to get away from an orca, with a few dead on the beach below. Steve, really enjoying your New Zealand series. Me too, as I relive the trip. 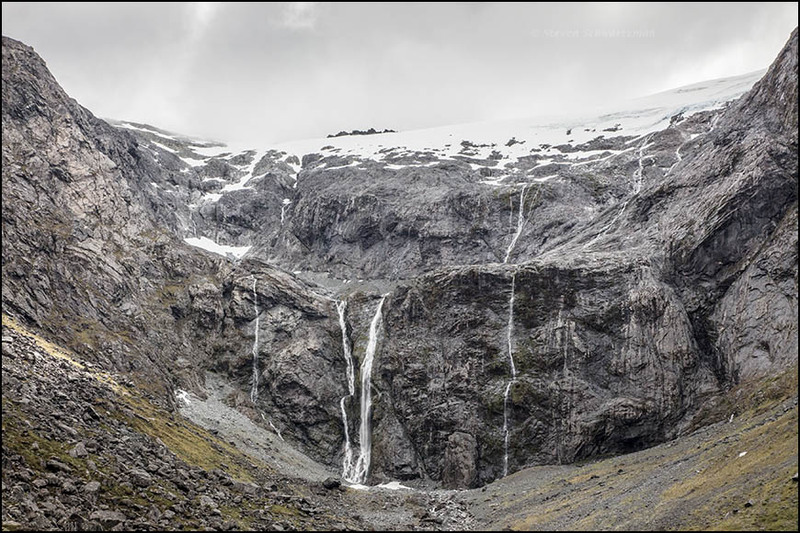 I hope viewers are enticed to visit NZ. Steve, through your beautiful photographs I am reliving my experience in NZ that took place 20 years ago. I am truly jealous of your series from Milford Sound that must have been shot on the one day of the year that the sun was out! As you mentioned stepping out of your car in route, I can only assume that you did not share my thrill of the quick return to Queenstown from the sound via small airplane! Look forward to more memories. You’re correct that we didn’t return to Queenstown in a small airplane. For my purposes as a photographer, a car lets me stop whenever and wherever I want to take pictures. Plenty more of those will appear in the remaining half of this retrospective’s posts. I would have found myself sidetracked with those seals all day long. In fact, I’m impatiently awaiting that upcoming post you mentioned. Ha ha! What a beautiful place this is. With these seals you couldn’t have been sidetracked for long unless you’d rented a canoe or small boat of your own because the cruise boat moved on after a few minutes. The place you’ll see in a few days had road access so you could’ve stayed as long as you wanted. Yes, New Zealand as a whole, including this part in particular, is quite scenic. I keep encouraging people to go for a visit. 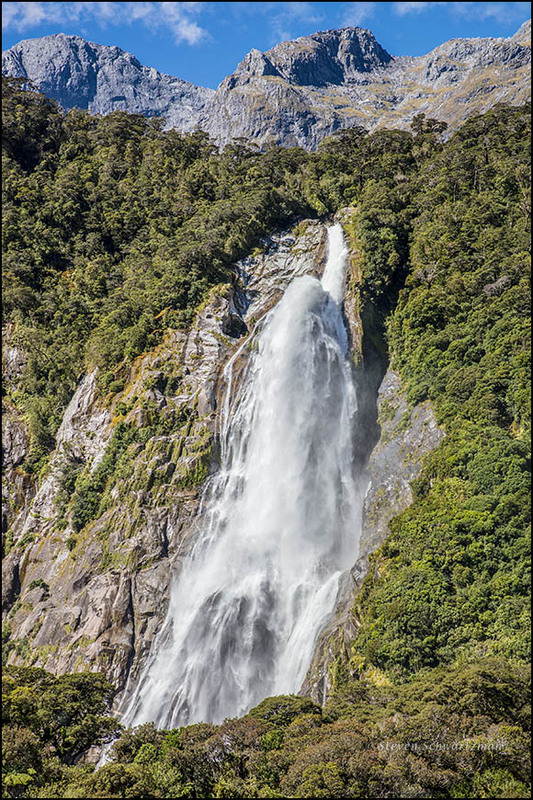 In fact we were so lucky with our Milford Sound visit – the whole day was sunny. We had not expected that as it is unusual. I so enjoy your shots from your trip, Steve. These pictures must bring back fond memories for you. I’ve not been to Norway, so I can’t compare. I remember learning, in elementary school more than 60 years ago, what a fiord is and that Norway is famous for them. It took a long time to finally get to see some, and of course they were in New Zealand. It’s good that we both had steady doses of sunshine at a place that’s often as overcast as Milford Sound. When it comes to geothermal features, the United States wins out over New Zealand: nothing beats Yellowstone. Still, I was glad to visit Rotorua, which we focused on more in 2015 than 2017. Ten days from now you’ll have a post about our second visit there. Looking forward to it! I have never been to Yellowstone, but have frequently visited Iceland with fiery volcanoes and intense geothermal activity. Lovely outdoor baths in the hot springs among snow and ice. Recommended! Yes, Iceland’s long been on my list to fill out the triumvirate of best-known geothermal sites. When I was a kid in New York, Icelandic Airlines offered bargain fares from there to Reykjavik. I’ll have to check to see if that’s still true. Hope you get there some day. Time and money well spent. And what fun to be in a country whose language preserves the letters ð and þ, which Old English also had. Modern English has changed radically from Old English, thanks to huge infusions of vocabulary from Latin and Old French, and even wholesale borrowing of the compound tense structure from Old French. In contrast, I’d have thought Swedish, as a Scandinavian language, wouldn’t be all that different from Icelandic. But I guess Icelandic is the odd one out, with Norwegian, Danish, and Swedish being closer to one another. In fact I’ve heard that some linguists consider those three to be dialects of a single language. You are quite right. Iceland has kept its language almost intact from way back from more than thousand years ago when the Vikings came from Norway and settled there. Not many changed words, loans or such like we have in Sweden, Norway and Denmark. The English influence is not very remarkable either. There was a ban – no new words from other countries. Instead the Icelanders made up new words from their old ones. One example is “passport”- vegabrev (roadletter). In later years I believe they have changed some because of the immense IT revolution. Right. English-language technical vocabulary has made inroads just about everywhere. I’m amused when I see cliquez and haga clic on French and Spanish websites, respectively. I wondered if there might be a connection between the Homer Tunnel and Homer, Alaska, as those explorers did get around. It turns out there were two Homers, who were contemporaries. William H. Homer, for whom the tunnel was named, discovered the Homer Saddle (through which the tunnel passes) in 1889. Homer, Alaska, was named for Homer Pennock, a promoter of gold mines who established that town in 1896. I enjoyed the downward curve of the mountains in the photo you took while waiting to pass through the tunnel. Given everyone’s tendency to focus on mountain peaks, it’s an interesting contrast. And the underwater plants in the last photo are marvelous. With our water, such plants tend to appear green, yellowish, or brown. That magenta is gorgeous, and fascinating. As you said, the mountains outside the tunnel offer a contrast to peaks, and that’s a good reason to include the third picture. 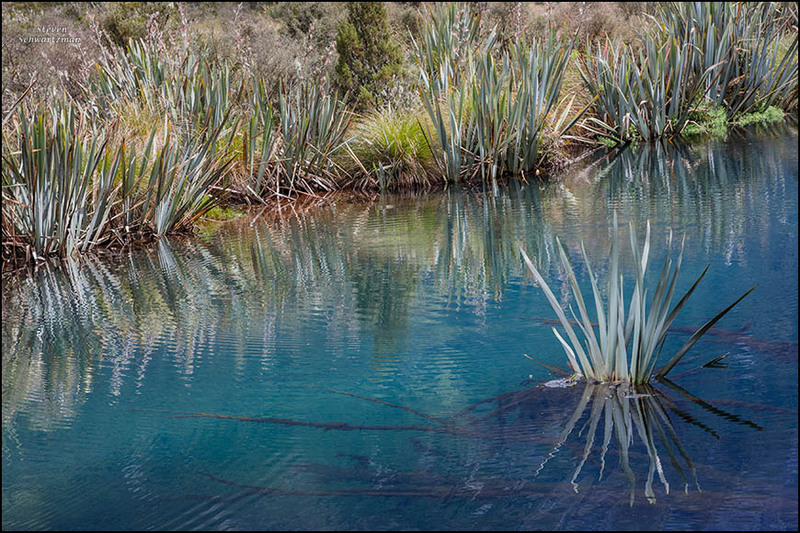 Also somewhat contrarian, when compared to photographs I’ve seen of the Mirror Lakes, was the last picture, especially its composition with the flax in the water at the lower right balancing the curve of plants along the shore. And yes, those underwater elements add uniqueness, too. I took the same pictures 🙂 I think you’re right, it’s flax. The Homer Tunnel was an experience for itself. It was so dark and I drove very slowly. The lights of the car in front of me were in a big distance. Exciting feelings! Milford Sound is a wonderful place! I guess we shouldn’t be surprised that you and I took some or even many of the same pictures in such a scenic area as Milford Sound. I don’t remember getting as excited about the tunnel as you did. There’s one in Zion National Park in Utah that you can thrill to if you ever get the chance to visit that part of the American West. The West of the USA…. My big wish!! It’s a fabulous region. I hope you’ll get there before long. Excellent. That’s just around the corner.